Your OneDrive cubbyhole lives on the Internet — the cloud, as the computing world calls it. And when your Surface is connected to the Internet, OneDrive files open just as if they were stored on your Surface. You can even fill the screen with your photos, scrolling through them like they were actually stored on your Surface. But here’s the clincher: If you want to open or edit those OneDrive files without an Internet connection, you’re stuck. So, if you want the luxury of editing your OneDrive files at any time, tell OneDrive to make those files or folders available offline. That way you can access them without an Internet connection. From the Start screen, tap the OneDrive app. 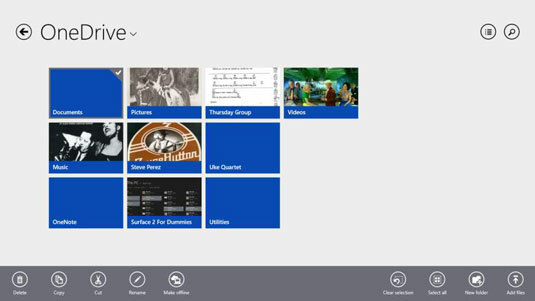 The OneDrive app fills the screen displaying all of your folders and files uploaded to your OneDrive account. Navigate to the OneDrive folder containing your folders and files. Select the folders or files you’d like to make available offline by swiping down on them with your finger. Swipe down on the Documents folder, for example. A check mark appears next to it, and the App bar appears as a strip below it. Tap the Make Offline icon. Whenever you edit an offline file or folder on your Surface, OneDrive automatically updates its own copy, as well, as soon as you reconnect to the Internet. If you use another PC to update OneDrive’s copy of that file, then OneDrive will automatically update your Surface’s copy the next time you connect to the Internet. If you’re editing a OneDrive file on one PC, and somebody else tries to open that file on another PC, he’ll be able to open the file. But he won’t be able to edit it. Instead, he’ll see a Locked message that lists who is currently editing that file. When the other person closes the file, you’ll be able to edit it. Making OneDrive files available offline consumes storage space, and most Surface models don’t come with much storage space to spare. To keep from filling up your Surface, choose only your most important files or folders to make available offline.